Read a book. Feed a community. 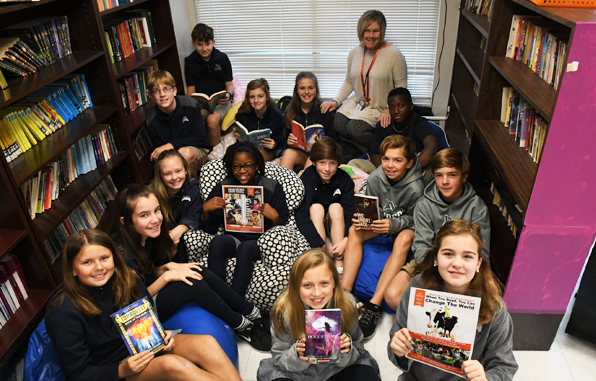 It’s a simple concept that fifth and sixth graders in Nan Dear and Shelle Pinkard’s classes are learning through the program Read to Feed through Heifer International. The program works like this: Students enlist a sponsor who donates a pre-determined amount of money for each book the student reads. Money is collected at the end of each semester then goes to Heifer International, an organization that provides livestock and training to a family facing poverty. That family then shares this knowledge and the first female offspring of their livestock with another family, ultimately creating a self-sufficient community. In addition to monetary donations, the students give the gift of their time at Heifer International ranch each spring. “We are trying to use an intrinsic reward system to teach kids the value of giving to others not as fortunate as them. They don’t get an award for their reading; they get the reward of knowing they have helped someone in need,” says Pinkard. She hopes that as students read to benefit others without expecting anything in return they will develop a love of reading, a passion to help others, and a desire to create a better world. The students have responded positively to the project. Last year they raised over $2,300, and they have a goal of raising $5,000 this year. In addition to supporting self-sufficient communities, the money collected from the students’ reading accomplishments can go toward sending young girls to school in third world countries or donating a “Gift Ark,” which moves healthy livestock throughout global communities passing on the gift of food and knowledge on a worldwide scale. If you would like to sponsor a student or help in any way, please contact Shelle Pinkard at spinkard@jacksonacademy.org. You can also get more information at readtofeed.org.